This project was phase one of three, over three years in the same garden. 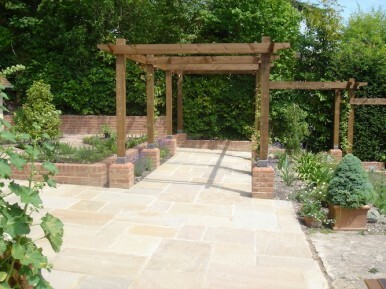 The timber pergola was designed to link the herb garden and the lower garden, whilst extending down the flight of steps. All the posts are elevated off the brick piers on bespoke galvanised pins and concealed by wrapping the base with lead, which is fixed into a recess and filled with grey flexible sealant. Electric light sensors were placed at the top and bottom to activate the lighting system upon entering or leaving the pergola. All the planting was undertaken and vine eyes and climbing wires were attached.